Breakfast can be a bit of a battle at my house. Are we having a quiche with sauteed leeks and a thick, rich custard? Or are we having bacon and fried eggs? While I'm usually pushing for the former or something similarly sophisticated, I don't entirely hate it when the boyfriend wins out. One of his favorite things to make on those mornings is a proper English fry up. Think bangers, fried eggs, baked beans, grilled mushrooms and tomatoes. Since I knew we would be having an English fry up this Sunday, I decided to bring in a little bit of sophistication by making some stuffed portobellos to go along with everything that the boyfriend was pulling together for the fry up. 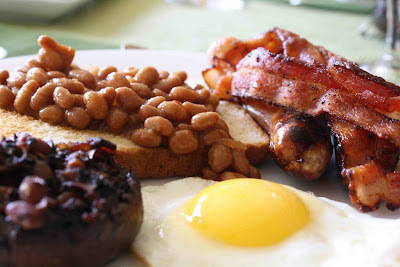 I'm giving you the mushroom recipe here, but to pull together the rest of the breakfast, here is what you will need: baked beans (preferably Heinz), toast (must be white), english bangers (sausage), bacon (if the sausage isn't enough meat for you and yours) and fried eggs (1 -2 per person). Often we also grill tomato halves as well if you'd like to throw those in the mix. Remove the stems from the portobellos and use a melon baller to scoop out some of the flesh. Chop the removed stems and flesh and place in a medium bowl. Slice the bacon strips in half lengthwise and chop into small pieces. Cook until golden brown. Add the bacon and 1 T bacon grease to the chopped mushrooms along with the baked beans. Mix together, adding salt to taste, and divide mixture between the four mushrooms. Pour the olive oil in the bottom of a baking dish and add stuffed mushrooms. Make sure the bottom of the mushrooms are coated thoroughly in oil and cook for 20 - 25 minutes until tender. Serve alongside your English fry up and enjoy! Yum! I love anything with baked beans! What is it about white toast, it is just so much better than brown. I actually had beans on toast for dinner tonight. I had a craving for them and Graham was busy painting the bathroom ceiling. This is the perfect Sunday morning breakfast! Can't wait to try it. I love your recipes. They're all so delicious, and easy. I love weekends because of breakfast :). This looks so hearty and full of flavor! Beans on toast.My husband spent some time in England. When he first told me about this I thought he was crazy but I think it is good and quick. We add a slice of cheese under the beans.